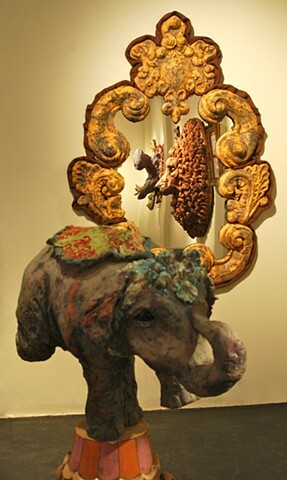 The elephant is made from wheel thrown components which are altered and adorned. The trunk is hand built. Behind the elephant is one of the mirrors, "Spectacle" and the reflection of the lion, "Silent Scream" and the hippo, "Insatiable" can be viewed through the mirror.